WFP has provided food assistance to more than 500,000 displaced people across the Central African Republic (CAR). The United Nations today resumed food aid for some 100,000 displaced people in Bangui, capital of the strife-torn Central African Republic (CAR), for the first time in nearly three weeks since deliveries were suspended when machete-wielding men stormed the distribution site and food was stolen. 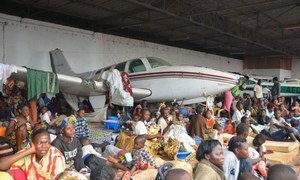 The UN World Food Programme (WFP) distributed food, buckets, tarpaulins and water containers provided by other organizations at Bangui airport where an estimated 100,000 people have sought refuge, and plans to reach all the displaced people there within 10 days. The last food distribution took place on 18 December. At the same time, WFP voiced deep concern at deteriorating security in the northwest of the country and urged all parties to the conflict to ensure safe access to people in need of assistance. Thousands of people are estimated to have been killed, nearly 1 million driven from their homes, and 2.2 million, about half the population, need humanitarian aid in the conflict that erupted when mainly Muslim Séléka rebels launched attacks a year ago and forced President François Bozizé to flee in March. A transitional government has since been entrusted with restoring peace and paving the way for democratic elections, but armed attacks between ex-Séléka and Christian anti-balaka militias have escalated significantly in the past two weeks. Yesterday during a briefing, Under-Secretary-General for Political Affairs Jeffrey Feltman warned the Security Council that the situation in CAR risks escalating into sustained violence along religious lines and spilling beyond the country’s borders, further destabilizing the whole region. United Nations agencies are scaling up efforts to assist the scores of civilians uprooted by the surging violence in the Central African Republic (CAR), reported to number over 100,000 in the capital alone, bringing the total number of those displaced since the conflict began a year ago to over half a million.